Got white spot on you tongue? They can also be the sign of a serious condition such as oral cancer. Make note of your symptoms to alleviate this discoloration. There are a few conditions that can cause white spots to appear on the tongue. In some cases this can become a white coating that covers the whole tongue. Sometimes this white coating is temporary and harmless, but in other cases this is a side effect of another condition which may require medical attention to treat adequately. Checking into your other side effects can help you narrow down the cause of the white spots on your tongue so you can focus on getting rid of them. What Do White Spots on Tongue Look Like? It will vary based on the nature of the cause. Spots can be quite small and even, but they can also be large and irregularly shaped. In most cases spots on the tongue begin on the sides of the tongue and spread to the center of the tongue. In some cases spots will grow into a coating that covers the tongue. This can continue to grow to be quite thick if it is allowed to continue unchecked. Coatings on the tongue can also start to take on other colors based on the foods you eat or bacteria that may become caught in this coating. When there are white spots, you'd better take immediate measures to find out its reason. Possible and common causes of white spots in tongue are given below. Thrush. One of the most common causes of white spots or coatings developing on the tongue is thrush. This is a growth of yeast that has manifested itself in the mouth. These white spots can develop on the gums, cheeks or the roof of the mouth in addition to developing on the tongue. Spots caused by thrush can resemble cottage cheese and does not scrape off easily. Poor nutrition and antibiotics can increase your risk of developing this issue. Excessively dry. If your mouth becomes excessively dry you can develop white patches on the tongue. These spots are not dangerous, but are simply a sign that your body is experiencing dehydration. In this case, patches should not gain any volume or fuzzy texture, though they may feel dry or uncomfortable. Lichen planus. Those who frequently develop spots on the tongue or skin may be affected by lichen planus. This is essentially an allergic creation to hepatitis C. The spots occur when you are having a reaction due to exposure to the condition. This condition is made worse by the use of tobacco products. It is not uncommon for patients to develop more serious spots on the tongue after using chewing tobacco. This is also a risk because lesions from lichen planus can turn cancerous with extended exposure to tobacco. Geographic tongue. 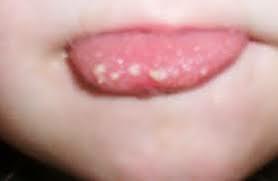 Geographic tongue can also cause growths to develop on the tongue. These patches will be white and flaky, similar to the type of patches that appear on the skin when someone suffers from eczema. Some doctors believe that these white spots are an oral version of psoriasis, but others believe that this is an allergic reaction or the root of stress in the body. Oral cancers. Some oral cancers can manifest themselves as white spots in the mouth. In addition to developing spots on the tongue, you may see them on the gums or in the throat. If you frequently use tobacco products or alcohol you are have an increased risk of developing these kinds of sores. Men are also more likely to develop oral cancer than women. Leukoplakia.Tobacco use can also lead to leukoplakia. These are white patches that appear across the mouth, but mostly on the tongue. These patches are often irregular in size and texture, and may appear to be fuzzy. Those with a weakened immune system, such as those suffering from HIV or AIDS are at a higher risk for developing this condition. Coating. If the spots on the tongue begin to form a white coating on the tongue, it may simply be a coatingthat is built up. This coating can be caused by dead skin cells as well as remnants of food. If you are ill this coating may also be caused by mucus buildup because you are sick. The treatment your white spots require will vary based on the nature of the spots. When they first appear, try cleaning your mouth. Gently brush your teeth and tongue and use a tongue scraper to clear off any debris that might be lingering. You will also want to make sure you drink plenty of water to clear out any particles that are lingering in the mouth. Drinking plenty of water will also help you stay hydrated, which can help you remove spots on your tongue. If your tongue hurts, the spots have lasted for longer than two weeks or you have notices other changes in your mouth or tongue in addition to the spots appearing then it is vital that you see a doctor. These spots could be a sign that you are suffering from another illness that will require treatment to cure. If your spots appear to be a bacterial or fungal growth then you should see a doctor because you will likely need medication to help make the spots go away. Your doctor will also give you advice regarding diet and lifestyle changes that you can take on to help prevent these white spots from reappearing.